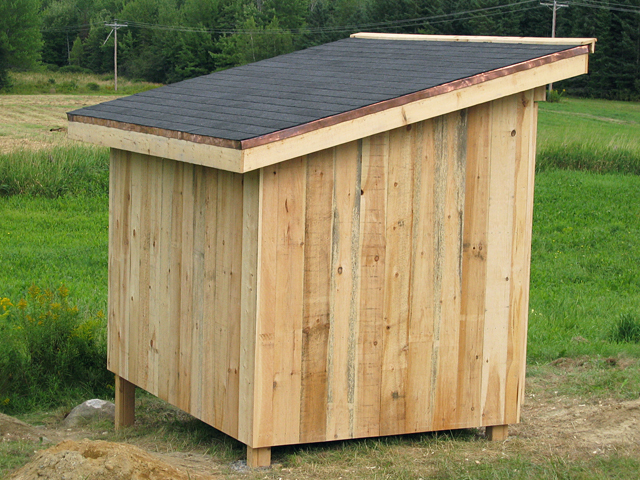 Designed and built for the client's male goat, the shed includes a sliding door and rough sawn cedar vertical siding. The client requested no treated lumber or concrete. Support posts are Port Oroford cedar set in gravel to below the frost line. The roofing is standard 20 year asphalt and flashing copper sheet. All wood was left raw as per the client's request. 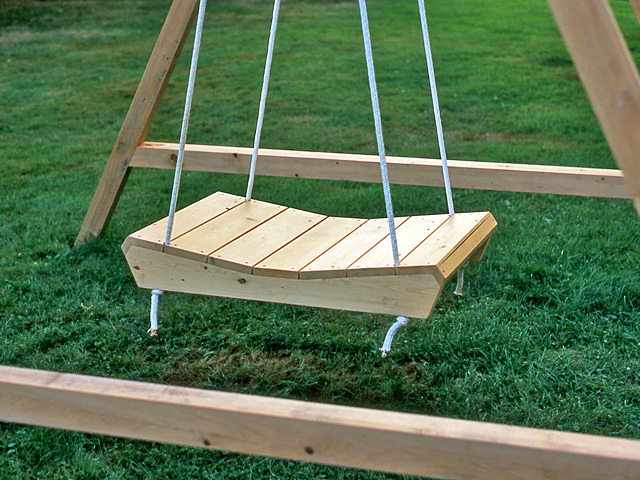 A swing designed and built for two people sitting back to back. 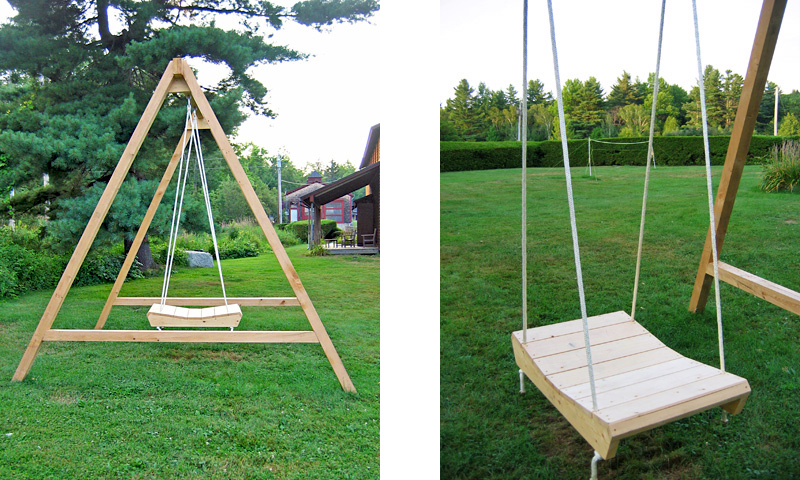 The seat is constructed of Port Oroford cedar attached via nylon rope to the temporary hemlock superstructure. 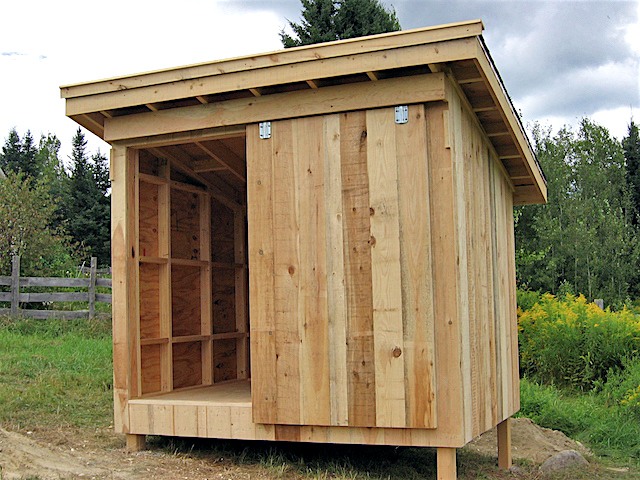 This species of cedar is of limited availability and expensive, yet is ideal for its appearance, workability, and decay resistance. Toward the end of a lengthy gut renovation, I built this difficult to photograph deck in a Brooklyn backyard. On the right, a detail of the floating steps. In the full shade, I ensured that these planks didn't rest on each other to help avoid trapping moisture. The STK cedar deck extends from a french door and has perpendicular edge banding. On the right is a detail of the edge banding and horizontal side skirt made from the same STK cedar planks. The homeowner allowed the deck to weather to its natural silvery gray color. 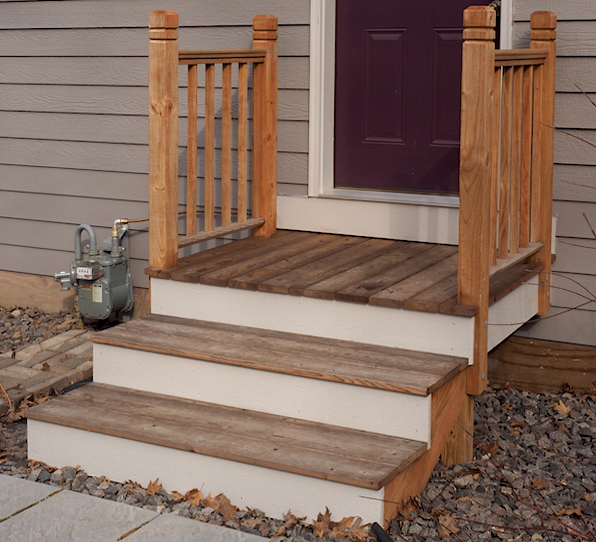 On the left, a door set into the deck to access to a landscape drain that clogs often. On the right, vertical framing of skirt planks and hose bib extension. Five concrete piers were poured below the frost line with galvanized, heavy duty deck supports inserted, aligned, and leveled before the concrete set. Inserted into these supports are a network of doubled beams and joists made of treated southern yellow pine. A staircase with a rise too high and rotting railings needed to be replaced. The client requested that I re-use any intact cedar boards and in this case only two risers planks were salvageable. Details of the junction of the railing post and tread. 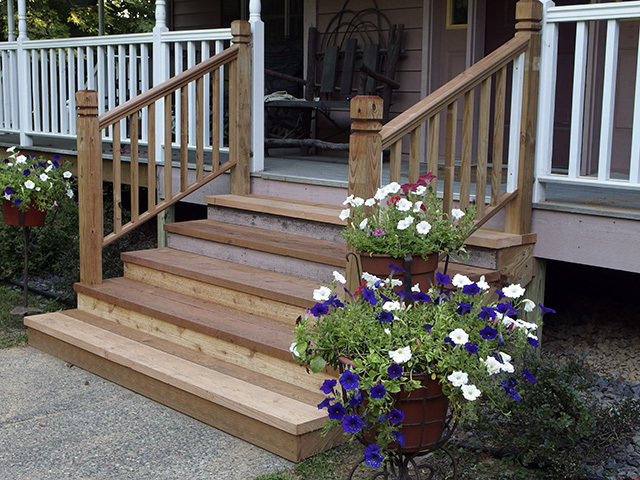 The client requested off the shelf, treated and dyed handrails, posts and balusters. Off the shelf cedar would be less likely to warp or check, but more than doubles the cost of these components. The structure needed to be updated and replaced with new, custom stringers and support posts. On the left is a galvanized post to rim joist tie that wasn't required when the porch was built. On the right is the post-pier connection. The ground contact rated treated southern yellow pine post is set-off the concrete by a structural plastic base and anchored to the pier with a heavy duty galvanized bracket and concrete anchor. The old posts were not connected to the concrete, a practice that would no longer be allowed. 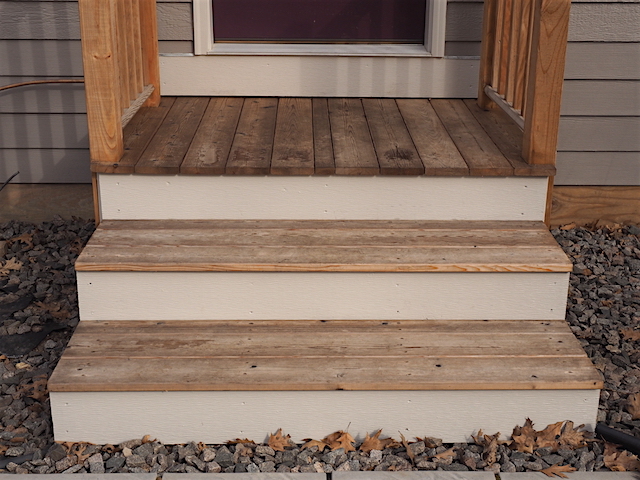 The risers are made of rough-sawn dimensional STK cedar and the treads finished with rough-sawn, 1.5 inch thick cedar. Too many homes were built with the landing deck running right up to the door sill resulting in a rotted sill after 15 years of exposure. The landing railings were shot, but the structure was decent. However, to get to the sill the landing needed to be removed, so the client chose to replace it. This created an opportunity to lower the landing deck so that snow doesn't sit above the sill. 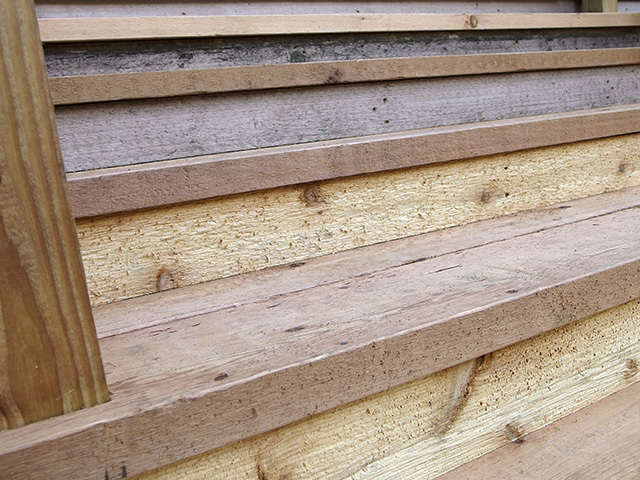 The STK cedar planks were run longitudinally with a slight slope to help run water away from the house. Retail treated and dyed southern yellow pine handrails and posts were used. When choosing this material, I am always mindful of the twisting and checking that will come once it is differentially moistened and cooled. In this instance, minor twisting and checks were acceptable if the client could save on material costs. 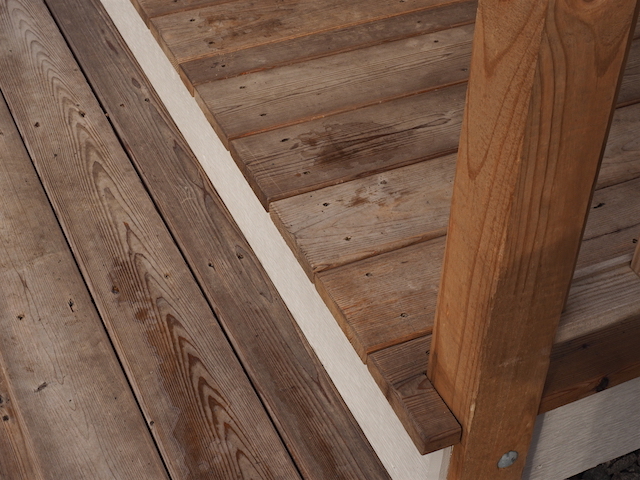 The STK cedar planks were treated with Thompson's Water Seal, a product I become more skeptical of each year. There are few if any treatments that offer true long term protection, especially if you are interested in a clear wood finish. Many add UV stabilizers to help protect the film, but most won't prevent graying of the wood much longer than untreated wood, are environmentally harmful, and have to be continually re-applied. In the case of Thompson's, I find that the waxes do not always absorb upon reapplication creating a greasy finish that is terribly slippery and visually offensive. 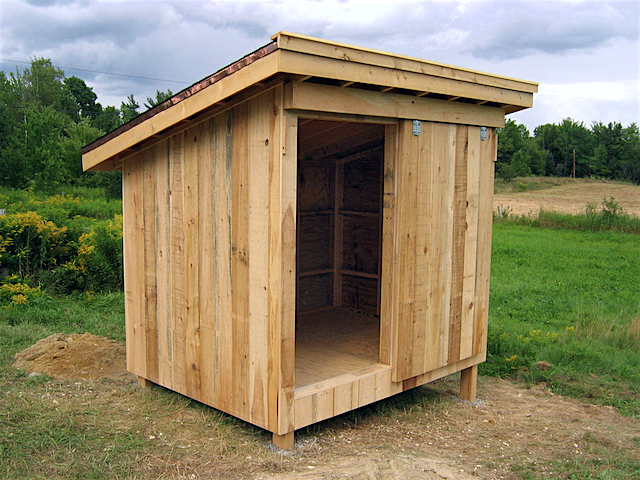 Some pigments (think rust red painted barns) added to stains offer protection because certain pigments will absorb UV radiation of the sun and convert it to heat energy, as opposed to chemical reactions within the coating or the wood underlying it. Chemical reactions are bad because they create oxidation and free radicals that, just as in the human body, begin the process of breaking down the organic polymers that make up the coating as well as the wood.